An F-35A and F-16 from Edwards AFB join an F-15E and F-22 from the 422nd Test and Evaluation Squadron out of Nellis AFB, and an F-18 from Air Test and Evaluation Squadron 31 out of Naval Air Weapons Station China Lake, to fly in a formation flight during exercise Orange Flag on December 13, 2018. Orange Flag was developed by the 412th Operations Group to evaluate teamwork across the separate United States services to integrate joint forces across a wide range of mission areas. The events enable the test community to capture data to assess the interoperability of multiple aircraft platforms in an environment outside of traditional Edwards testing. In addition to the fighter jets, B-52, B-2 and B-1 bombers participated in Orange Flag along with KC-135 and KC-10 aerial refueling tankers. 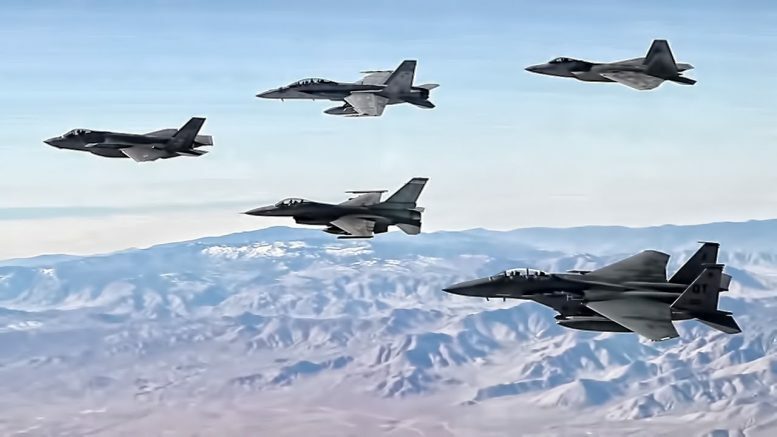 “The latest event involved a total of 18 aircraft in six combat-relevant test tasks and experiments.” said Maj. Christopher Campbell, Air Force Test Center, Orange Flag Evaluation Director. Campbell said the team will analyze the data collected and apply it to develop new air power capabilities.